We most certainly would like to let our pets enjoy the holidays as well as we do, specifically cat owners. It's very common for cat owners to provide their cats with the necessary tools, equipment and accessories to let them enjoy and live comfortably. You'd see them get the best cat tower, cat scratcher, cat litter box and more. But that seems to be not enough to show our pets, great deal of love, care and compassion. That's why most of us cat lovers still try our best to go beyond such as letting them enjoy what we enjoy during the holidays and look for the most adorable and the best cat costumes for them to wear. This is a common thing we see in social gatherings such as home and family parties. You'd see cat dressing up in costumes for Halloween, Christmas, Birthday, Independence Day and other more celebration. It's actually not necessary for you to do so but it would be kind of fun especially that you're treating your cats as part of your family. This is also common for dogs but it would only look adorable on smaller size pet such as small dogs or cats. You'd see how cute and cuddly your pet would look like wearing costumes and dresses. However, unlike for us pet owners, we rarely see any shops or pet stores that sell pet costumes for any occasion. It's kind of hard to look for and some opt to just craft their own with the help of DIY guides. Fortunately, there are some costumes made for cats that could go in any types of holiday may it be Christmas, New Year, Halloween and more. It ranges from basic costumes to full set costumes where price varies. To save you cat lovers some time, we've come up with a short list of the best cat costumes for 2018, complete with comparison and reviews. Does it matter if you buy cheap cat costumes? Will cat costumes be able to withstand excessive scratching? Can dogs use cat costumes? Will it fit any cat size? Can it be used for different holidays? Our first choice is a police cat costume made for Halloween. It is a complete costume set from head to toe, with accessories that really brings out a real police outfit. There are sizes available for this costume set. This could also be used for small dogs as they have almost the same size as of cats but is mainly used for cats. The manufacturer provides a neck chart size where the size classification has been varied. Check it out and vary it with your pet size to avoid any wardrobe malfunctions. Sizes are available for small, medium, large and extra-large pets. The costume is made from quality fabric that could sufficiently sustain a pet's behavior. It is best used for small to medium cats to bring out the best fashion style. The costume is complete with all the accessories needed to portray an actual police. The police costume comes with a police hat. It's already complete and ready to wear. 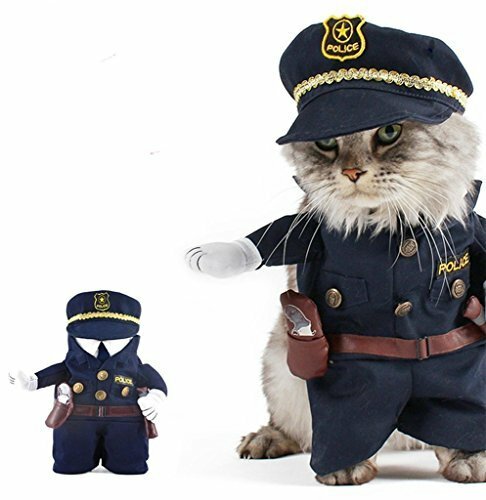 No need to look for accessories that would complete a police cat outfit. This costume is themed as an all-around wear for any holidays, competitions or events. It is much more affordable than buying individual piece of costume and putting it all together. This saves you time and money rather than crafting your own pet costume or DIY costume. It might not last long to large cats movement. Cats could easily tear the costume apart. It requires some supervision as your cat walks around wearing the costume. 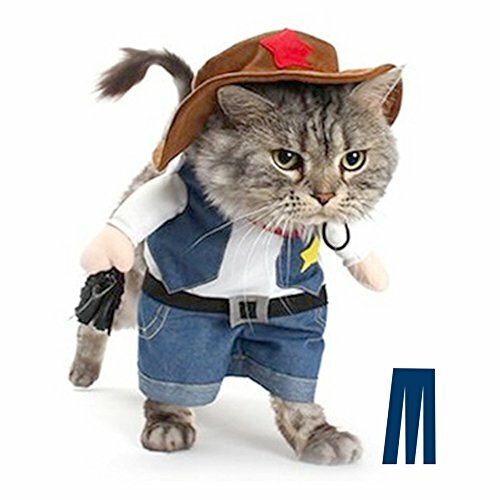 This is the Mikayoo Cowboy Costume set for cats. The western cowboy outfit would really bring up a crowd worn by cats. It will make your pet look irresistibly cute and adorable. This costume is one of the funniest and best cat costumes ever. It's ideal for parties, holidays or costume competition event. This can be used by cats and small size dogs. There are actually different sizes that you could vary to your pet size to make it fit and comfortable for them to wear. Price differs from each sizes but barely noticeably as it is still within budget range and highly affordable. The costume is made from polyester fiber. It's made to be very comfortable for cats to wear. This costume natural attracts crowd and attention when worn by cats. It comes as a complete set that's ready to wear. It can be used on any costume party, occasion or holiday. It is already ready-to-wear which saves you a great deal of trouble and time to find individual piece of costume. Could be used for dogs as well which means it could be re-used or re-worn by dogs as well as other cats. There's many sizes you can choose from, perfect for varying your pet's size. The fabric is intentionally chosen to provide pets with great comfort. Scratching behaviors of cats and dogs could tear the costume apart. It may have large size available it could just fit a small size dog. Next cat costume is only made for cats. It is a Lion Mane outfit from KINGMAS. It can fit most cast having an average neck girth of 10 inches to 12 inches. There are no sizes available for this costume. If your pet is within the recommended neck girth measurement, then it'll fit your pet perfectly. This is a simple costume that only covers the head part of the cat. It still brings out the cuteness of the animal regardless if it only covers the top part of their body. It's perfect for Christmas, Halloween, New Year, Cosplay party and other more occasions. The costume is made from polyester fabric which makes it highly comfortable for cat wear. This lion head costume is made with detailed hair design and features a lion ear. It is realistically close to a real tiger hair. The lion wig is very easy to wear and very easy to remove. It fits the neck and head perfectly without causing any stress. This is best for cat owners who need a costume that can be easily worn by their pet. 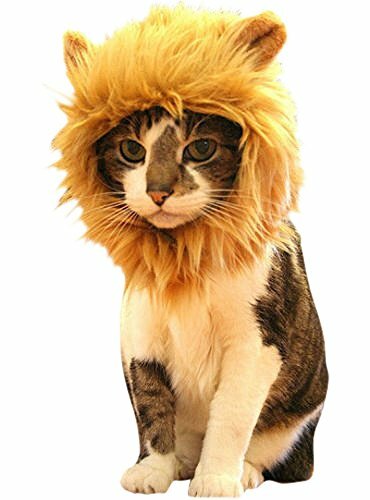 It converts your adorable cat into a King of the Jungle. The polyester fabric does not cause any allergies or irritation as well as providing great comfort. This can be used at any occasion at almost instantly. It has not sizes available or is only free-size. Make sure to measure your cat's neck girth before purchasing. There are no colors available and it only covers the head part of your pet. Unlike the Lion Mare costume that makes your cat look intimidating, strong and intense, this Bunny Rabbit Pet Hat Costume from Happy Smile would really bring out a heartwarming appearance. It will also make them look cute, cuddly and soft. The hat is designed to imitate bunny ears. It can be used and easily worn by cats and dogs. This could be a normal house costume or for any costume parties. This also works great as an insulation hat during the cold weathers to go along with your pet's dress. There are 2 sizes available, medium and large where small pets can still closely fit a medium size hat. You can also choose a tiger hat apart from the bunny hat if you want to have that intense look. The medium size hat has a neck size of 12 to 14 inches in diameter and best worn by cat's having 12 to 22 pounds of weight. Large size hat neck size is about 14 to 16 inches and will best fit a cat weighing about 22 to 30 pounds. It uses soft and comfortable fabric and can be easily worn. The hat securely places itself on the chin area using a velcro lock. It has a simple wear design that you can wear and take off at any time. 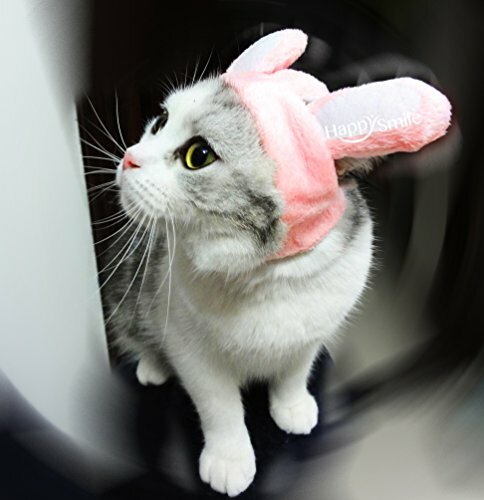 The bunny hat uses light pink color which resembles cuteness and softness. Can be used for normal days apart from holidays, occasions or parties. If used in parties and competitions, you'd still need a costume for the lower part of your cat's body. The velcro could hardly lock when used to small or extra-large pets. Next costume is a Lion Mane head costume from Sporer. The great thing about this Lion head compared to the previous head costume is that there are lots of colors to choose from. However, this comes slightly expensive compared to the previous Lion Mane head costume. With this, you easily vary the color of the costume with the color of your cat's coat or hair. Perfectly match the costume to bring out realistic head and body hair composition. It is guaranteed to make your pet cute and adorable, attracting lots of viewers during a party, holiday or in any occasion. Colors or designs available are black hair, black and red, gold, gray, white and yellow. It is highly convenient for both the cat and the owner, very easy to wear and take off. The head costume is made from comfortable fabric. It can also be used by small dogs and other types of home pet, as long as it fits. Best used in animal cosplay, costume parties and holidays. The options provided for colors and design is actually great for really getting that perfect costume and body coat combination. Its application covers different animals as long as it is within the recommended neck girth of 10 to 11 inches. It has realistic design and detail. This costume naturally attracts people and wins their admiration. It would cost you an additional time, money and effort looking for a body costume that you can pair with the head costume. It does not have any sizes available. The costume is made using a standard free-size ranging from 10 to 11 inches of neck girth. This key feature is common and one of the most important things for every successful and useful product. Relating it with the best cat costumes, you need to take an extra look and consideration about the quality of materials used. You can check the fabric quality of the costume, most especially if it has or it is a wig. Cats have excessive scratching behaviors which could easily tear low quality fabric apart. If it is not put into any measures, the costume would only last the first or the second time of use. Quality fabrics are also and usually hypoallergenic. It does not impart any physiological reactions to your cat. What good would it be if a costume has an unpleasing design and details? This key feature refers to the aesthetic aspect of a certain product. Design and details should at least be pleasing, attractive or if not, simple. In the sense that a cat costume should make your pet look cute and adorable, this key feature is rather important. There would be no need to get your cat a costume that brings any attraction. You'd rather let the animal be with what it looks like without any clothing as it is already cute if design and details are way off than expected. A great costume for cats will always have close-to-realistic details. This is a basic key feature but it's always best to include it to the guide and to keep it in mind. Some costumes do not offer any sizes or have a fix, free-size. 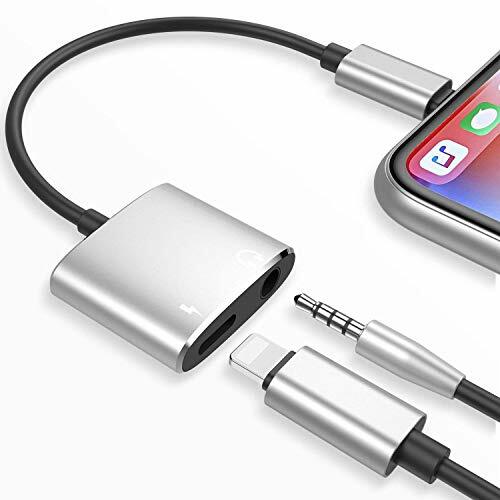 The size is usually being discussed in most product details. It's something that you can't miss but you still need to check it at most times, especially when you're purchasing something that needs to be worn. You need to check your pet size and vary it with the specifications of the product. You wouldn't want to see your pet getting stuffed inside something that makes it very uncomfortable. The best costume for cats doesn't need to be expensive. It’s not practical to spend so much on something that will just make the animal look great but won't improve anybody comfort nor will it benefit its well-being. Look for something with key features present but also within range of your budget. Cat costumes will last long with the right quality but it does not guarantee that you'd use it most of the time or during the next holiday or cosplay event. It'll probably just end up sitting in your closet waiting for the next time you'll use it. Of course, if budget is not of any issue with you, you can always give your cat the best and the most expensive things to show your affection. Next key feature is reusability. It does not make sense to buy a costume that can only be used for one to two times. The reusability of the best cat costumes are also relative the materials used and the size available of the product. A costume that has been torn apart by your cat won't be of any use the next Halloween or Christmas comes around. Also, there are some costumes that can be worn by both cats and small dogs. The same with best cat shampoo, costumes can also be used for dogs as long as it fits and depending on its design. It might come in handy that you're showing up with a pirate or police cat one party and a pirate or police dog the next. It would save you money and effort looking for a different costume for each type of animal you have as a pet at home. There are actually a lot of cat costumes at an affordable price having in them great qualities and key features needed. It does not matter if it's cheap as long as it can live up to the standards of certain key features. However, if you feel like giving your pet the best of everything regardless the price or value, then an expensive cat costume would really make a difference. It is however, sort of an impractical notion to buy something so expensive with no health benefits for your cat. Low quality costumes will never get past through cat behaviors. With their clawing and scratching, costumes that used non-quality materials will get torn apart easily. A good quality costume does not need to be expensive. There are some cheap and affordable costumes that could survive the struggles of clothing a cat. Just make sure to consider the key features discussed to secure a quality cat costume at an affordable price. That depends on the size and design of cat costumes. There are some designs that can only fit the head, neck and body shape of a cat but there are also multi-animal costumes that could fit both cats and dogs. You'd only need to take some considerations with the sizes as cat costumes can only fit a small dog or puppy. You'd need to get a separate costume for dogs. The standard measurement of a cat costume or most cat clothing is based on the neck size of the cat. The average neck size of an adult cat is 12 to 14 inches. Vary your cat's neck size with the dimension of the costume's neck diameter. You'd also want to check out if the product offers different sizes from small, medium, large and extra-large. Yes it can. Cat costumes are usually reusable and can be worn in most occasions. However, if you plan on getting your cat into any costume competition, you'd want to know about the rules and the theme of the competition. But if it is an open theme and all that matters is the crowd's attraction and cuteness of your cat, then you're good to go. In conclusion, the best cat costumes would favorably increase attraction and will make your pet look good in any social interactions such as holidays, parties, competition or gatherings. The key features will make things easier for you to look for a quality costume. It will also provide your cat with comfortable clothing that they could wear when you show them off without sacrificing lots of money, time and product quality. 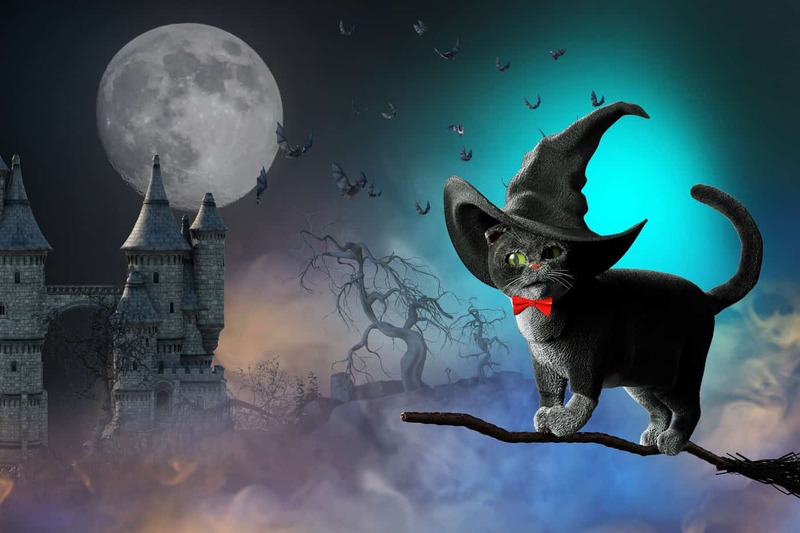 Most of cat costumes are at an affordable price but there are some that are really expensive that you need to think if it's really worth it knowing it does not have any health benefits to offer as most cats does not like clothing. But regardless, most pet lovers just want the best cat gifts for their pets and making them look good an appealing is really something a cat lover won't let pass. As long as it makes you happy and your cat look great, the value of the things you give will still be worth it.